The Mahatsara School provides Quality Education to over 100 students who would not otherwise have the opportunity to attend school. In 2012 the grade 5 students won top place in the region. In addition all 27 grade 9 students passed the difficult National High School Entrance Exam, to receive their Junior Dipolmas. This is very important as it is the gateway to higher education in Madagascar. The kids at Mahatsara form are a happy and energetic congregation ranging from young to mid teens. There is a school community garden project cultivated by parents, students and other community members. There is a lunch nutrition program to ensure each child receives at least one healthy meal per day, and a Mahatsara Parents Association which is a real driving force behind the school. The school runs a community library; books are very expensive in Madagascar and most have been donated by international volunteers. Sports programs are also organized: in 2011 the basketball team made it to the regional finals. The school has taken students on several field trips in the surrounding area. Among the most significant field trips has been a trip to the capital of Madagascar, Antananarivo through which older students at the school had the opportunity to see the capital and tour the University. For most students, this was their first trip to Antananarivo. Finally a Mahatsara store is organized, selling school supplies and other small items to community members who can afford them. All proceeds are put back into the project. 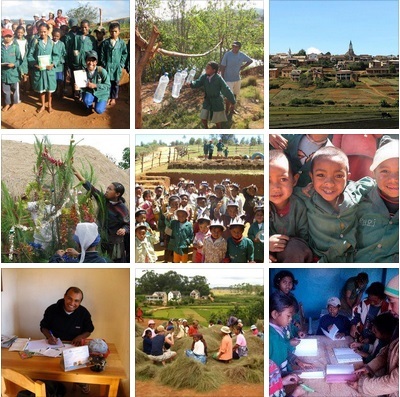 This entry was posted in Education, Training, General interest, Madagascar, Rose International Network by gwillg. Bookmark the permalink.